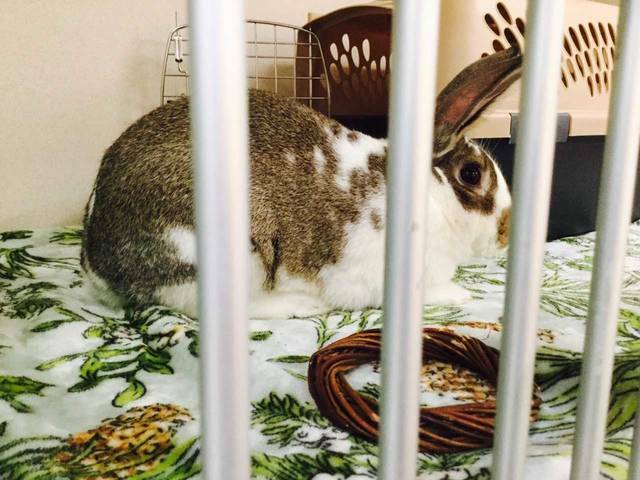 Dozens of rescued house bunnies like this one await adoption in animal shelters throughout the country. The organizers of BunFest ask that people bring their bunnies to the festival inside travel safe containers. Many festival attendees pushed their bunnies in strollers throughout the event. The Capital Area Humane Society parked a mobile rabbit rescue bus near the entrance of the festival filled with bunnies for adoption. Dozens of people and bunnies of all ages visited the Northland Performing Arts Center in Columbus Oct. 14 for Midwest BunFest 2017. The rabbit festival was sponsored by the Ohio House Rabbit Rescue, a non-profit animal rescue agency dedicated to educating people about rabbits. The Columbus-based agency has built relationships and collaborates with a number of non-profit rabbit rescue organizations, among them the nearby Columbus House Rabbit Society and the Buckeye House Rabbit Society. Dozens of rescued rabbits are in need of adoption in Ohio, said local volunteers who organized Midwest BunFest. 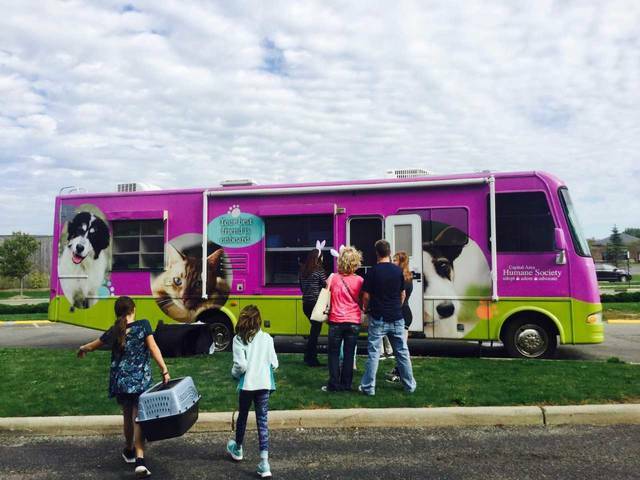 The Capital Area Humane Society parked a mobile rabbit rescue bus near the entrance of the festival filled with bunnies for adoption. Visitors were allowed to go inside the bus and volunteers helped people pet, hold and adopt bunnies. The agency rescues abandoned and neglected rabbits and places them with new homes in the same way that the humane society helps to find homes for cats and dogs. There is a $40 adoption fee for rabbits that includes neutering/spaying and shots, said humane society volunteers. Festival-goers were encouraged to bring their house bunnies to the festival to participate in the events. 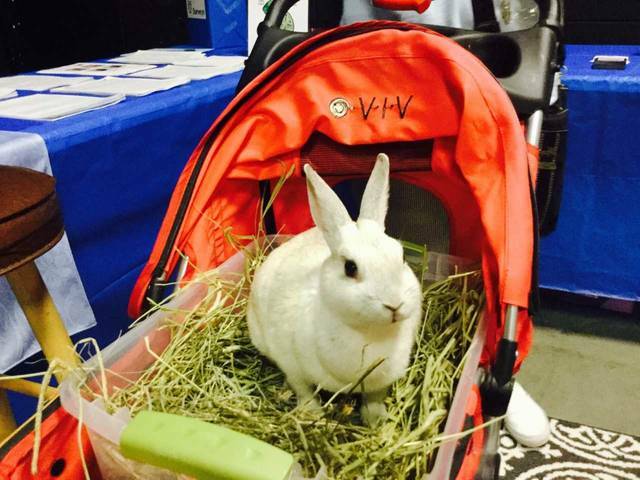 Many people brought strollers and carriers in which to push their bunnies throughout the venue’s many vendors, events and programs. Inside the venue at Midwest BunFest were two lecture rooms with speakers giving presentations about rabbits and their care. Veterinarians and technicians were available for 15-minute question and answer sessions at the conclusion of each discussion. A bunny day spa was located on the premises where people could take their rabbits, if they brought them to the event, for a pampering that included brushing, hair removal, nail clipping, and gland cleaning. The time slots for the bunny day spa filled quickly with a two-hour wait for walk-in visits. A staff volunteer recommended registering online ahead of the event to schedule a spa treatment. Reiki and craniosacral therapy, for pain and stress reduction, was offered for rabbits and their owners by Columbus-based Reiki & Craniosacral Therapy for People & Animals. Bunny glamour shots were another feature at this year’s BunFest and vendors sold handmade rabbit dresses, bows, and accessories. A quiet bunny lounge was set-up with individual covered pens to give rabbits a break from all of the excitement. Free samples of Fun4Bunnies flavored wooden toys and Small Pet Select orchard grass and wild flower blends were given to festival attendees, along with flyers and newsletters about bunny diets and health. Rabbit treats made of hay, clover, fruit and herbs were available for purchase from Doctor Doogs, with Blueberry Lilac selling fast as the most popular snack. Additional vendors showcased bunny decor, clothing, art, and accessories. The next Midwest BunFest will be held in 2018.
https://www.recordherald.com/wp-content/uploads/sites/27/2017/10/web1_bunna.jpgDozens of rescued house bunnies like this one await adoption in animal shelters throughout the country. https://www.recordherald.com/wp-content/uploads/sites/27/2017/10/web1_bunna2.jpgThe organizers of BunFest ask that people bring their bunnies to the festival inside travel safe containers. Many festival attendees pushed their bunnies in strollers throughout the event. https://www.recordherald.com/wp-content/uploads/sites/27/2017/10/web1_Bunna3.jpgThe Capital Area Humane Society parked a mobile rabbit rescue bus near the entrance of the festival filled with bunnies for adoption.